A special treat only available for the Holiday season! These two-bite cookies are made with gourmet chocolate cookie dough, filled with white-chocolate fudge combined with crushed peppermints, and topped with ribbons of white chocolate. It melts in your mouth with a cool taste of mint. Perfect for those Holiday gatherings! 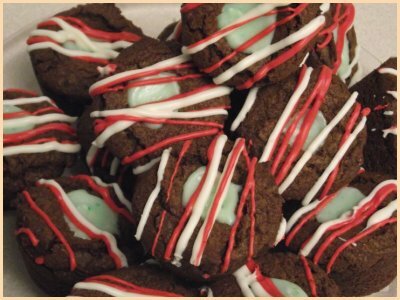 24 Chocolate Peppermint Cuppies - $25. Currently Available, but only until the end of the year! Check out our other Seasonal product, Mint Chocolate Bonbons - only available during the holidays!